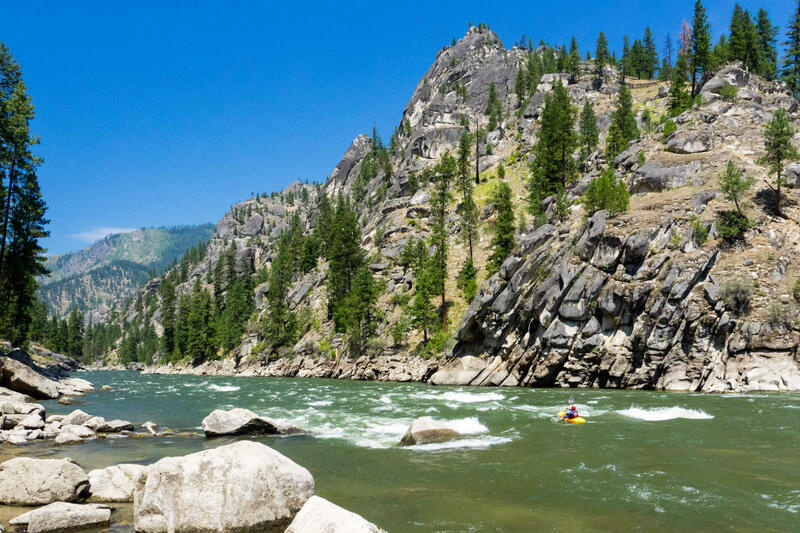 As I push off from Corn Creek into the clear blue waters of the Salmon River, I feel that rush of excitement that comes with paddling a new river. The canyon hillsides mix dark metamorphic outcrops with tall stands of pine and green grasses, making a mid-July fade into gold. Across the river floats my kayaking buddy, the Perfessor, and the oar-rig with three of his friends. About this classic week-long trip, I know very little. In fact, most of what I supposedly “know” comes courtesy of the 1954 debacle—excuse me, motion picture—River of No Return, with Marilyn Monroe and Robert Mitchum. If I’m to trust that cinematic experience, I should expect 30% bouncing down a Technicolor river in front of a green screen while an overly eager production assistant splashes me with buckets of water. And 70% oddly choreographed wrestling matches with gunslingers, prospectors, Marilyn herself, and some stereotypical movie Indians—who for some reason swim out mid-rapid for the fight. At the climax of the film—I mean, trip—we will hurtle haphazardly over Bow Falls—in Alberta, where they actually filmed the movie. And, like many facts about the west (when no one wants to look them up), I should readily accept the screenwriter’s dramatic assertion that the Salmon River got its badass nickname from Native Americans, who said that anyone who goes downstream will die. It’s actually not a terrible film, and kind of worth watching in that midnight movie sort of way. But regardless, as I paddle my kayak playfully through the first riffle, I’m hoping to learn the real story. 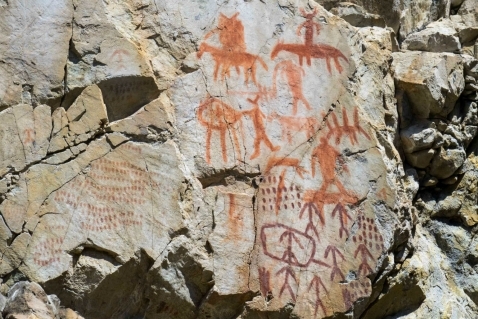 Our first stop is at Legend Creek to see ancestral pictographs drawn with red pigments. The date of creation is uncertain. But since they depict men on horseback, you can assume Native Americans created them after Europeans introduced the animal to the continent. At the time of Lewis and Clark’s expedition in the early 1800s, the Nez Perce called the region surrounding the Main Salmon home. During the post-Civil War frontier-era, the discovery of gold in the watershed brought prospectors, lawlessness, and frequent skirmishes with the native residents, somewhat like those depicted in the film. During the late-1870s, the U.S. Army forcefully relocated the tribe to a reservation on the nearby Snake River—after one of the most famous standoffs of the American Indian wars. Over nearly four months, Chief Joseph led several thousand Nez Perce on a 1,170-mile flight from the U.S. Army. After many battles and the death of over 1,000 tribe members, they surrendered only 40 miles from the Canadian border. 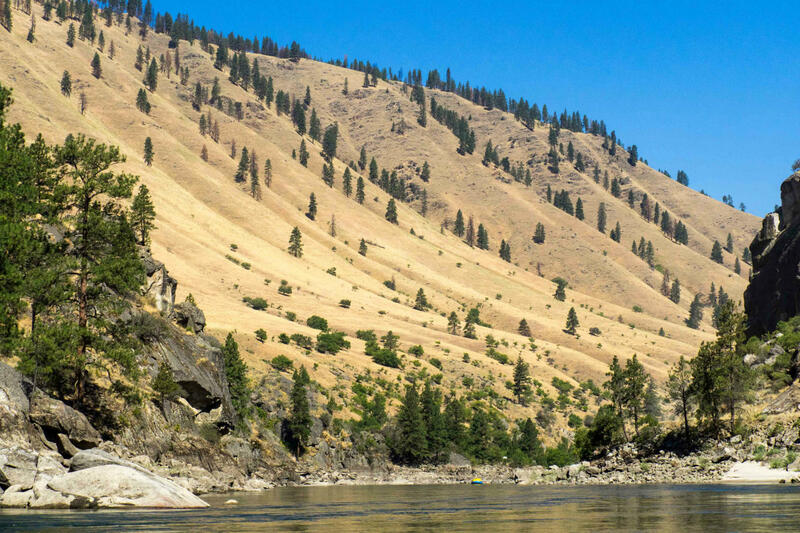 The real story behind the nickname for the Salmon River comes from the logging that followed the gold boom. Given the challenging rapids and twisting course, logs couldn’t be floated freely down the river. So loggers built wooden sweep scows higher in the watershed for transporting lumber to settlements downriver. Since the boats couldn’t return upstream, they were dismantled and sold off as well. Thus, the river gained its one-way moniker. Continuing downstream, we splash through fun waves and dodged holes in Ranier Rapid. Next, we encounter our first jet boat, rocketing upstream, ferrying paddlers to Corn Creek for tomorrow’s launch. 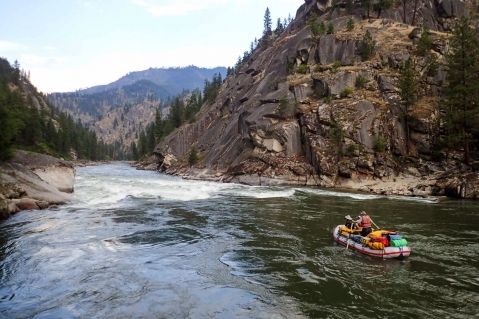 The jet boats, which travel in both directions on the Main, are a unique feature of this wilderness—a bit ironic on a river called no return. While some boaters bemoan their presence, and they do take a little getting used to, they actually provide a great example of how multiple users can coexist on preserved public lands. 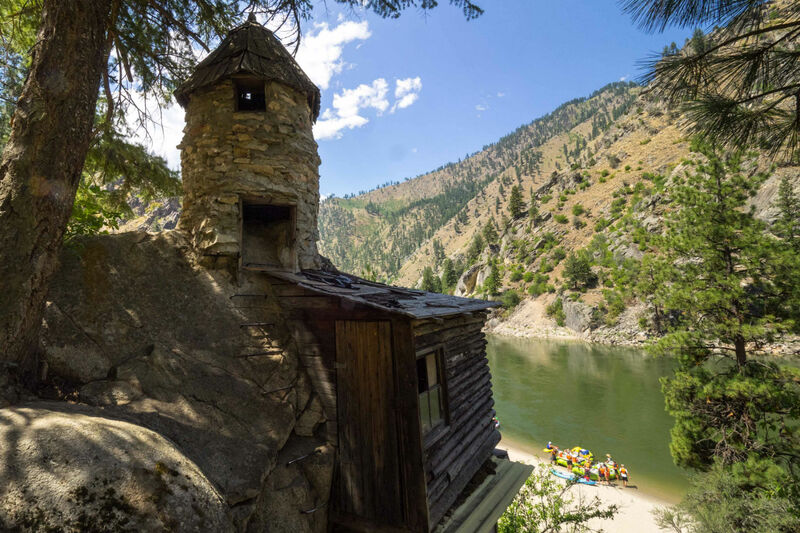 When the Frank Church-River of No Return Wilderness was established in the early 1980s, all recreational activities, and remnants of past human occupation were preserved as is. 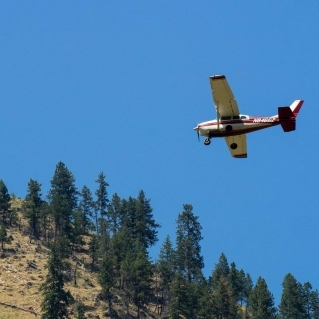 Not just the rock art and jet boats, but small aircraft continue to service airfields near river lodges while abandoned homesteads and still-occupied settlements sporadically line the shore. It’s for this reason that the Main is like a living museum of times past. Not far below, Perfessor and I watch a bald eagle snag a two-foot trout directly in front of us. Only to drop it over shore and see it stolen by another bald eagle. 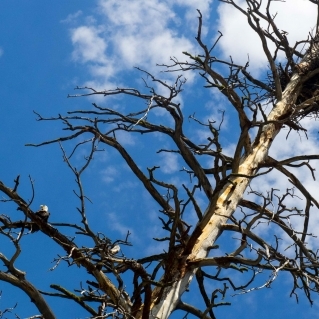 I’m so busy watching this scene, I almost don’t notice a third bald eagle perched patiently beneath a massive nest in a dead tree overhead. Apparently, this calm soul knows there’s plenty of fish left so why fuss about it? 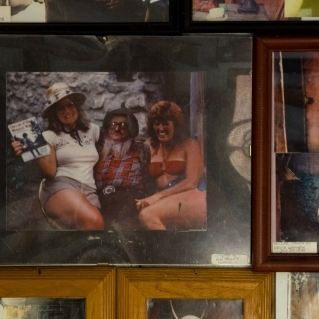 Frank built his first cabin in 1925, when he was 35 years old. He planted an orchard, panned for gold, fought fires, and built trails in the river canyon—the forest service eventually hired him. 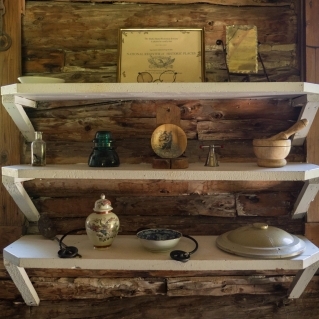 He met his wife in 1935, and they built a second, larger cabin five years later. She died of a blood clot in 1955, and nine years later the cabin burned down, along with everything Frank owned. 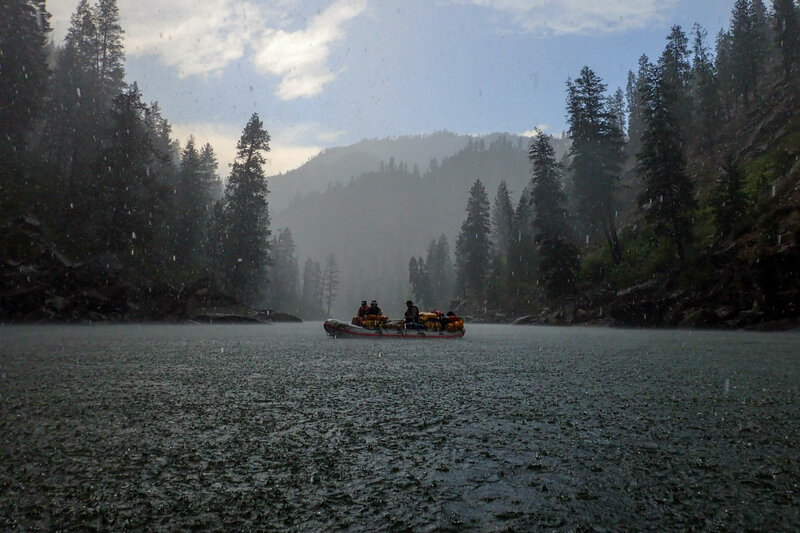 With winter approaching, a team of volunteers—forest service members, power boaters, and locals—came together to erect the third cabin. The organizing superintendent received an official reprimand for his unofficial efforts. The next day, the rapids pick up. At one time, Salmon Falls was a big one and even after loggers dynamited it, the Falls still challenged river runners until 2011. That spring, heavy rains atop snow sent a huge debris flow down Black Creek, a half mile downstream, which formed a new rapid and turned Salmon Falls into a slowly-moving pool. As we arrive to scout above Black Creek, there’s a crowd of guides and guests on the river-left rock. Because the Salmon flows freely, peak levels can reach upwards of 50,000 to 100,000 each spring, and the new rapid re-arranges regularly. 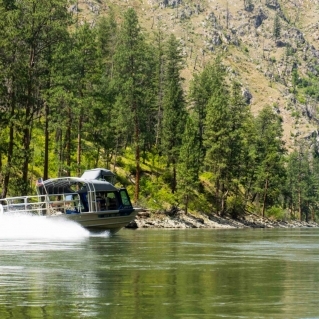 In the current, a jet boat takes practice runs up the rapid to explore the latest hydraulics. The raft goes first down center-left. Perfessor and I decide to run far-left, punching over some laterals near a swirly hole. I plunge in first, the waves smack me but come through unscathed. Glancing back, I notice the lateral collapses right on top of Perfessor, and slams him into the meat of the hole. It flips him immediately. He hangs on for a few valiant roll attempts before wet exiting. Just after we regroup, the sky darkens, and a mountain thunderstorm descends with rain, lightning, and eventually marble-sized hail which plunks off our helmets and decks. Fortunately, the sudden storm ends right as we reach Barth hot springs. While warming up with a soak, kayakers and two commercial guides rowing gear rafts join us. I’d previously met one of the rowers at the put-in, a fellow Duct Tape Diaries’s contributor Andy Hinton. As a third-year guide on the Main, he tipped me off to the remarkable history of this canyon, explaining much of the best was yet to come. 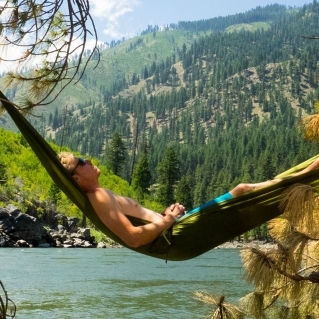 Day three is more layover than mile-maker, camping just below Bailey rapid, we swim in the eddy, nap in hammocks, and hike the trail which follows the river in many sections. That night, Perfessor tells me he’s feeling pretty tired. Multiday trips are especially challenging at 76 years old. Over the years, the Perfessor has joined me and friends—many half his age or less—on plenty of whitewater trips across the country, including one favorite, the class IV-V Cheoah in North Carolina. As friends his own age have understandably retired from whitewater, the Perfessor has become a personal hero of ours while he strives to go out on his own terms. His final big multiday sendoff will be the Grand Canyon. With renewed confidence on day four, the Perfessor and I have clean, fun lines at rapids like Five Mile, Split Rock, Big Mallard, Elk Horn, and Growler. 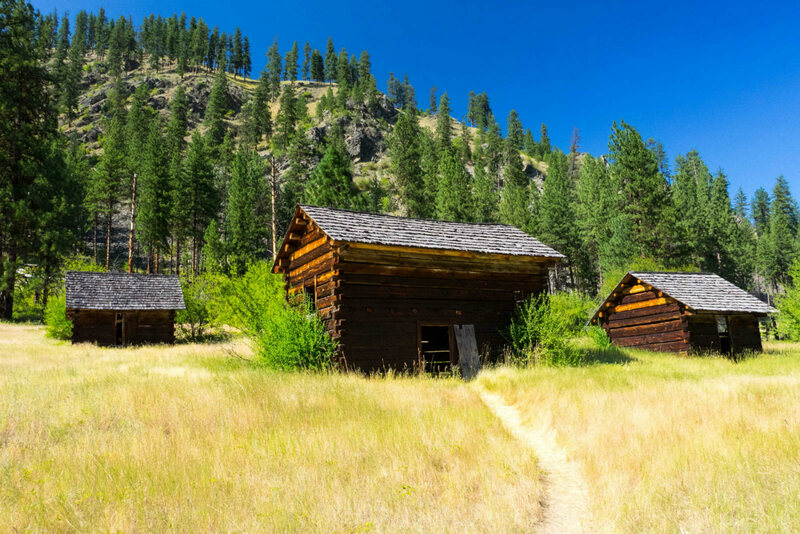 From camp, we visit the Jim Moore mining camp, with nine ax-hewn log buildings that are on the national register of historic places. Unsuccessful at mining, Moore established a trading post here and sold supplies to other miners on their way to Thunder Mountain, a supposedly rich gold deposit on the historic Three Blaze Trail. 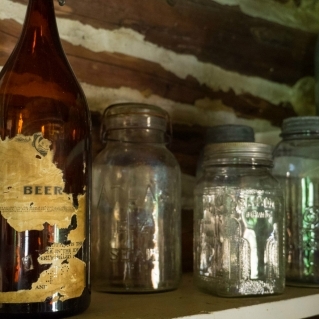 Legend says Moore hid his profits in a glass jar in a nearby rock slide, and some treasure hunters search to this day. I walk upstream and cross the Campbell Ferry pack bridge. Underneath, a commercial trip of dories, rafts, and duckies zips into the eddy for lunch. High on the opposite bank, I stumble upon yet another museum, one none in our group previously knew about. The Campbell’s Ferry Historic Homestead. Ringing a bell, a caretaker appears and shows me around a few preserved buildings and exhibits about the ferry that brought miners to Thunder Mountain. By far, the highlight of day five is the Buckskin Bill Museum at Five Mile Bar. Called the last of the mountain men, his real name was Sylvan Ambrose Hart, and his nickname came from his homemade deer hide clothing and moccasins. Perhaps the most colorful historic character along the Main, it can be a bit tough to separate fact from embellishment. In a hilarious short autobiography published in the book River of No Return, Hart describes his life from an upbringing in a dugout in Oklahoma Indian Territory until occupying the bar during the Great Depression. He lived mostly self-sufficiently there, other than a few far-flung adventures, until his death in 1980, at the age of 74. Hart attended several colleges, claimed to have studied nine languages, worked in the Texas oil fields, built bomb sights in Kansas during World War II, traveled to Iceland and Northern Europe, and built flint-lock rifles hailed as masterpieces. 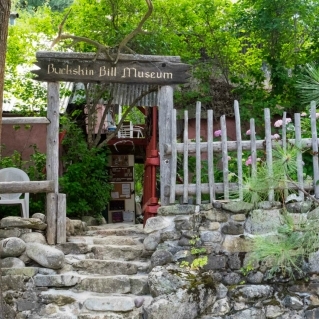 As Buckskin Bill, he became somewhat famous in his lifetime, often posing for pictures with visitors—especially younger ladies—in the 1970s and receiving a television crew for an interview, which plays in the museum. Buckskin Bill’s most famous exploit was his long-time stand-off with the forest service. Before senator Frank Church championed the wilderness designation, the area was national forest lands. Around the 1960s, the forest service wanted to declare the area primitive and burn most of the historic structures along the Main. To oppose them, Buckskin Bill built a turret tower at Five Mile Bar and allegedly stood guard with a Gatling gun. Wouldn’t you know, the forest service had a change of heart and decided Buckskin Bill was fine right where he was. 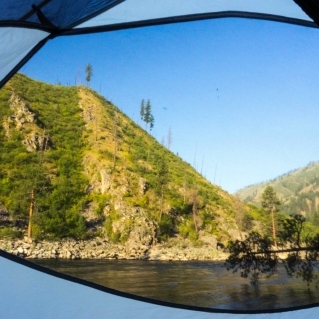 That night in camp, our oarsman and Perfessor’s lifelong boating friend Gordo, an Idaho native, tells us how the Forest Service offered him the option to purchase one of the first-issued commercial permits to run trips on the Salmon. In the 1960s, the USFS and Boy Scouts put together an early exploratory rafting trip to consider permitting procedures. Gordo was a part of that crew and due to his participation, the forest service offered him a permit. He declined, wanting to attend college and explore the country. But he always wondered how his life might have changed had he become an outfitter on the river. We were growing closer to the takeout, but we still had several great rapids to descend. Before passing the typical take-out at Vinegar Creek—we planned to float on to Gordo’s town of Riggins—there was one more historic stop—easily one of the best. Polly Bemis was born Lalu Nathoy in China in 1853, as told in the book River of No Return. Sold into slavery by her impoverished father, her owner brought her to Portland only to sell her again to a Chinese merchant. 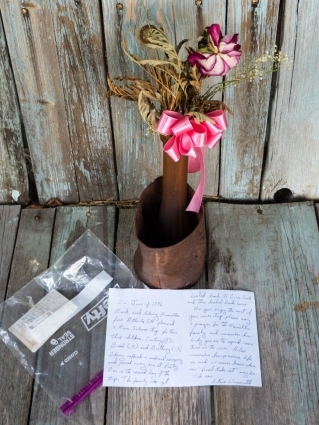 He took her to Warren, Idaho—where she got her nickname—to work in a gold mining town. Somehow, she was freed, possibly in a poker game, and became involved with a lazy gambler named Charles Bemis. Charles suffered a shot in the head after a poker dispute, and Polly nursed him back to health. 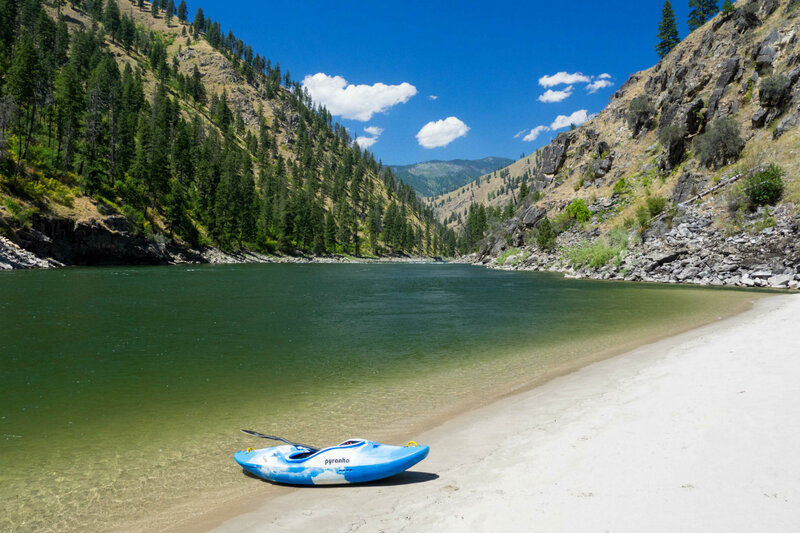 They moved to the Salmon River around 1894, where Polly became one of the most beloved figures on the Main. If she was five feet tall, it was with boy’s boots on, which she had to wear given her feet had been bound as a child in China. This gave her sub-100 pound frame a rolling walk. Despite her size, she was as tough as any on the river. Planting trees, growing a garden, chopping wood, and caring for Charles. If you insulted her coffee, you might get a cleaver as corrective. Not long after Charles died, their river ranch burned. The widow Polly’s short stint in town didn’t suit her, so she made an agreement with neighbors across the river. 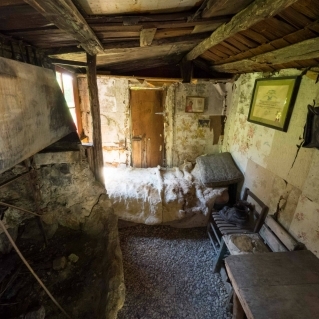 If they rebuilt her cabin, she’d leave it to them in her will. They agreed and even strung a phone line across the river, which Polly used to brag about her superior fishing abilities. 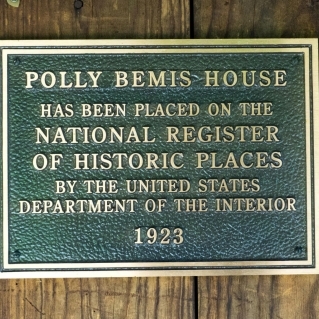 Polly died in 1933, but, today, her preserved cabin is listed on the national register of historic places. As I walk out from the cabin, there’s a raft group playing hacky sack on the manicured lawns. The orchard is in full bloom from the warm wafts of summer. Soon, I push off from the beach in my kayak, while another group arrives and heads up the hill. The Main Salmon is a story told by a river. Certainly not the whole story of America, but quite a cross-section of it. Its scenery reminiscent of time from a past long gone but in a place we can luckily visit. A living museum which we can return to again and again. 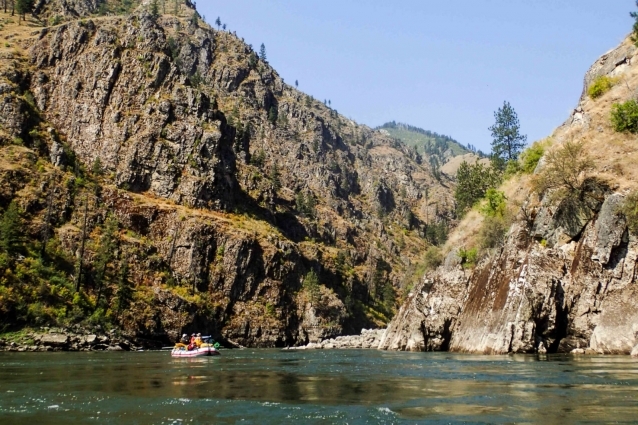 Editor’s Note: Boaters can apply for permits to raft the Main Salmon River via The 4 Rivers Lottery. Applications are accepted between December 1 and January 31.